Last week, researchers announced they had discovered a physical connection between the immune system and the brain’s blood supply. The finding gives researchers a novel approach to understanding diseases ranging from autism to multiple sclerosis, and strengthens the bridge between neuroscience and immunology. Maps of the lymphatic system: old (left) and updated to reflect the discovery discovery. Image credit: University of Virginia Health System. In last week’s issue of Nature, researchers led by University of Virginia neuroscientist Jony Kipnis describe their discovery of lymphatic vessels in the tissues beneath a mouse’s skull. Their observation was unexpected, to say the least. Lymphatic vessels complement the body’s blood vessels, carrying immune cells throughout the body instead of blood. But for decades, researchers had assumed that the lymphatic system stopped short of the brain. Kipnis’ team’s discovery turns that assumption on its head. “They’ll have to change the textbooks,” Kevin Lee, PhD, chairman of the UVA Department of Neuroscience, recounted telling his colleagues upon hearing of their finding. The science linking the brain and the body has come a long way in the past decade. Disorders like autism are anecdotally associated with gastrointestinal problems in children, and mouse models of autism have been empirically associated with the balance of their gut microbes. Similarly, an over-reacting immune system is associated with autism-like behaviors in mice, and can even transform strep throat into a psychiatric illness called PANDAS, a deceivingly cuddly acronym that stands for pediatric autoimmune neuropsychiatric disorders associated with streptococci. But how are gut microbes, the immune system, and neurons connected in the first place? Until recently, this was anyone’s bet. The immune system, which tracks and addresses threats to the body by way of the bloodstream, is directly exposed to neither the inside of the gut nor the brain. The gut microbiome is separated from the bloodstream by the lining of the intestines, and from the brain by the aptly named blood-brain barrier (BBB). Indeed, the brain was long considered to be “immune privileged,” or exempt from normal immune surveillance, both good and bad—a necessity given that, for instance, the brain can’t tolerate swelling from inside the skull. But in the last twenty years, the notion that the brain is immune privileged has been slowly dismantled. Careful studies have shown that the brain does interact with the peripheral immune system, albeit in unique ways. Immune cells do, somehow, circulate through the brain, and antigens—which would normally stoke an immune response—do drain from the brain into the lymph nodes. Moreover, neurological diseases like multiple sclerosis and Alzheimer’s have long been linked to changes in immune system function, and autoimmune diseases of the gut, like Crohn’s disease, correlate with psychiatric illness. One major problem for the field, though, has been the lack of a physical connection between the brain and the body that could help explain the mystery behind these diseases. But last week, scientists at the University of Virginia stumbled across such a bridge: a network of lymphatic vessels that appears to directly link the brain with the immune system. Hsiao has been at the forefront of the overlapping fields of neuroscience, immunology, and microbiology for nearly a decade. In recent years, along with others at Caltech, she characterized the importance of both the immune system and particular gut microbes in mouse models of autism. This past April, her lab showed that a particular type of gut microbe is responsible for spurring cells in the gut to produce serotonin—nearly all the serotonin found in the body. A model system of gut microbes believed to play a role in human diseases like Alzheimer’s. Pacific Northwest National Laboratory CC BY-NC-SA 2.0. Could autism, or PANDAS, result from some alteration to the gut microbiome that impacts the immune system via serotonin, and then spurs some change in the brain? Is the lymphatic system of the brain failing to clear out the proteins that accumulate into toxic plaques and tangles during Alzheimer’s? 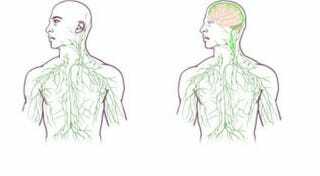 Or is the immune system malfunctioning during multiple sclerosis, due to its encounters with the brain via these lymphatic vessels? All these speculations become fair game with this newfound appreciation of the brain’s connection to the immune system. Wendy Ingram, a postdoctoral researcher in human translational genomics at Geisinger Medical Center in Pennsylvania, wonders whether this finding could shed light on her 2013 discovery that a particular parasite, Toxoplasma gondii, can cause mice to lose their fear of cat urine. After mice consume feces containing this parasite, the parasite somehow gets into the brain, and permanently disables an innate fear circuit—but until now, the options for traveling from gut to brain weren’t well understood. One compelling route for the parasite could directly involve this new lymphatic connection to the brain. After crossing into the bloodstream from the gut, T. gondii might hitch a ride with immune cells destined for the brain, “allowing them to transit into the CNS in a ‘trojan horse’ type of parasite delivery,” Ingram explains. Is the lymphatic system lighting the way for these parasites to get into the brain? Even our brains? Given that T. gondii permanently alters mouse behavior, even after it has been cleared from the brain, Ingram speculates there are numerous ways that the parasite might leave an indelible mark on brain function, though more research will be required to figure out how a microscopic parasite can actually eliminate the fear of cats in a mouse. “Suffice to say, there are likely many connections and interactions between the brain and the immune system which are completely unknown,” she says.